The 36 Express is great for running out to the canyons. 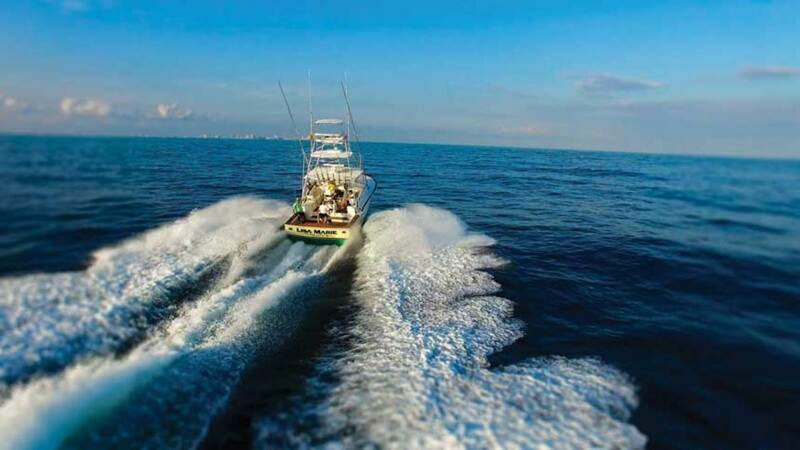 Two local competitions he’ll attend include the Ocean City Marlin and Tuna Club Overnight Billfish Tournament and the Beach Haven White Marlin Invitational. “Lisa Marie has consistently placed in the top three boats for the Release Award at the Ocean City Marlin and Tuna Club for the past eight years,” says Gallagher, who is the club’s commodore. But there’s one fishing trip he makes each year that’s more special than the rest. Choosing a Jersey Cape wasn’t hard for Gallagher. The company’s tagline is “Carolina flare with Jersey attitude,” and he has always admired the legendary boatbuilders of the Carolinas, such as Spencer, Jarrett Bay, Buddy Davis and Scarborough. Trading up from a 7,000-pound center console—with the majority of the weight hanging off the transom—to a 24,000-pound express with two diesels under the deck has paid off, Gallagher says. 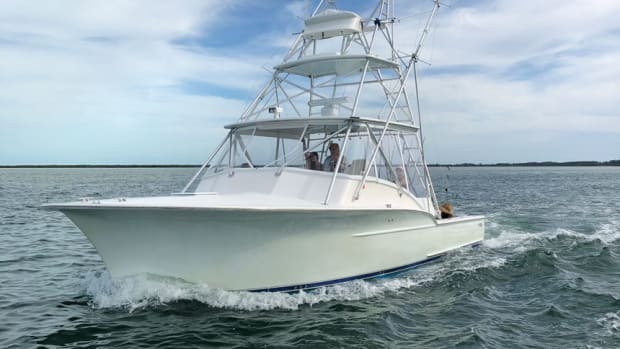 “Lisa Marie is a billfish-raising machine that’s very nimble when backing down.” Gallagher and his crew have had numerous multiple-release days, including one in the summer of 2016 when they released 11 of 14 white marlin that came into the spread. With overnight amenities, Jersey Cape makes a good cruiser, too. 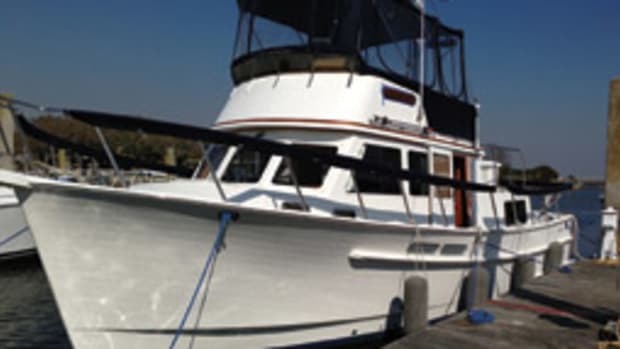 “My wife and I do plan to make a cruise down the coast, up the Delaware Bay and through the C&D Canal to the Chesapeake Bay and St. Michaels, [Maryland], this fall,” Gallagher says. Florida also beckons, for the winter sailfish season. 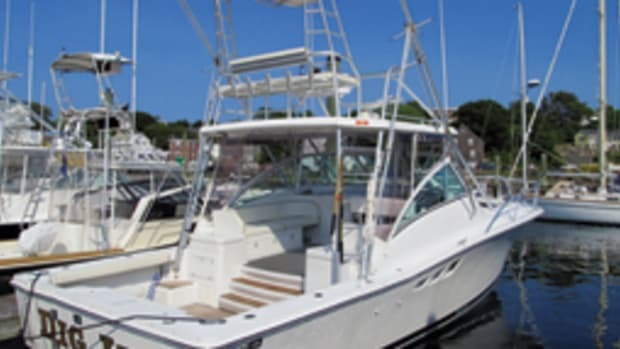 The Jersey Cape Devil 36 Express combines a Carolina look with no-nonsense, tournament-quality fishability. 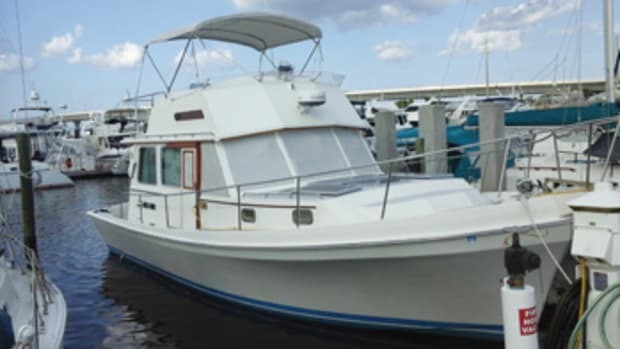 Standard fishing equipment in the semicustom boat includes in-deck, macerated fishboxes with drain systems, a molded-in bait prep area with a sink and gunwale rod holders. 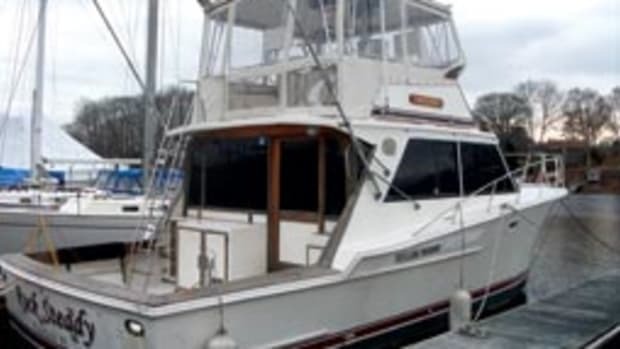 Options include a hardtop and/or a tuna tower, outriggers, a bait freezer and air conditioning at the helm. There’s also a standard cockpit deck plate for mounting a fighting chair. 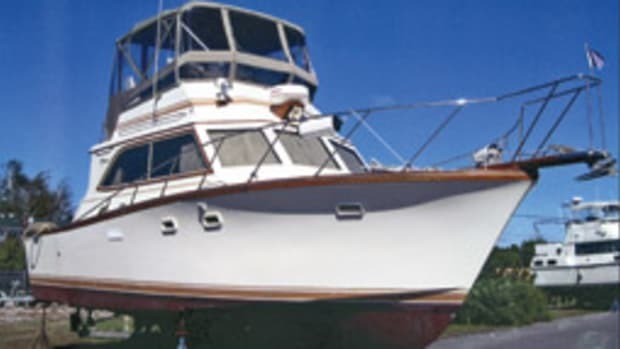 The modified-V fiberglass hull shows a moderate bow flare and a broken Carolina sheer. The helm is on the bridgedeck, mounted on centerline with a molded fiberglass station with controls and instrumentation. There’s a wraparound windscreen. Down below, the Devil 36 Express has a dinette with a high-low table that converts to a berth. Galley gear includes a ceramic cooktop and a refrigerator/freezer. A settee on the starboard side converts to upper and lower berths. The enclosed head compartment includes a vanity, sink and shower. 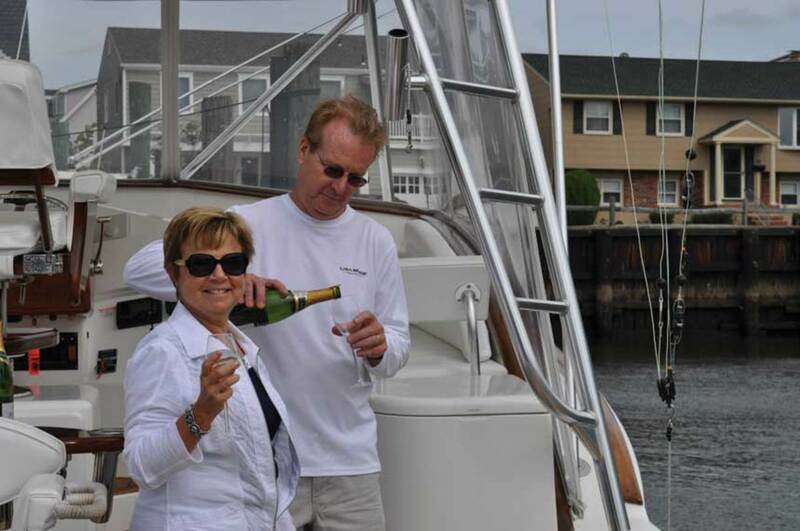 Ron and Lisa Gallagher celebrate the purchase of their Jersey Cape Devil 36 Express. Wayne and Genine Puglise, owners of Jersey Cape Yachts, build their semi-custom boats in Lower Bank, New Jersey. 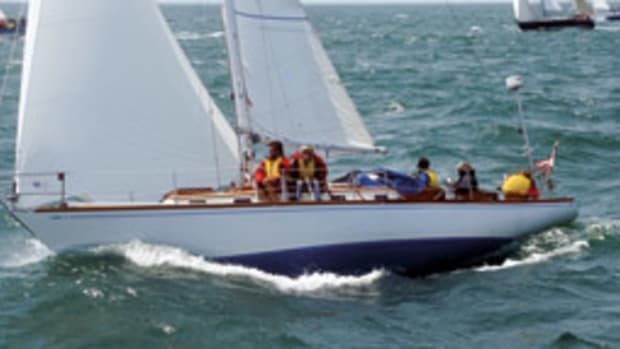 The Jersey Cape line includes the 31-foot Little Devil as well as 40- and 44-foot Sport Yachts, the Devil 45 and a 47-foot Express, and others. This article originally appeared in the February 2019 issue. Back in 2005, Howard Newman tested a boat at the Palm Beach International Boat Show.